Authors: Garanin A.A., Osadchuk A.M., Adyshirin-Zade E.E. Aim. To present a description and scientific substantiation of a new objective sign in patients with hiatal hernias. Methods. The study included 127 patients with diaphragmatic hernia, who made up the group of patients, including 65 women and 62 men, mean age 56.2±11.4 years. The control group was represented by the results of a survey of 100 practically healthy people: 55 women and 45 men, the average age of 52.6±2.3 years. All patients included in the study group, underwent upper endoscopy and fluoroscopy of the esophagus and stomach with a suspension of barium sulfate, the results of which were compared with the data of auscultation of the chest. Results. The description and scientific substantiation of the physical sign of diaphragmatic hernias was presented, which is pathological peristalsis at four points of auscultation on the thorax. The factors that led to the choice of localization of the points at which auscultation of esophageal-gastrointestinal-diaphragmatic murmur is carried out in this pathology, are presented. Pathophysiological mechanisms causing the appearance of pathological peristalsis of the esophagus and stomach, which is the essence of the proposed symptom of hiatal hernia, were found and substantiated. Sensitivity and specificity of a new method of detecting diaphragmatic hernia were calculated, the positive and negative predictive values were determined. High efficiency of auscultation of abnormal motility as a diagnostic method was demonstrated. The frequency of clinical symptoms in patients with hiatal hernia and their comparison with the world experience of observation of patients with this pathology are shown. Conclusion. The proposed objective sign, which has a very high sensitivity and specificity, is an attempt to fill the currently existing «diagnostic gap» between the subjective sensations of a patient with diaphragmatic hernia and instrumental diagnostic methods that have certain limitations in application. hiatal hernia, pathological peristalsis, esophageal-gastric-diaphragmatic murmur, physical method of diagnosis. Fujiwara Y., Arakawa T. Epidemiology and clinical characteristics of GERD in the Japanese population. J. Gastro­enterol. 2009; 44 (6): 518–534. doi: 10.1007/s00535-009-0047-5. Roman S., Kahrilas P.J. The diagnosis and manage­ment of hiatus hernia. BMJ. 2014; 349: g6154. doi: 10.1136/bmj.g6154. Majka J., Wierdak M., Brzozowska I. et al. Melatonin in prevention of the sequence from reflux esophagitis to Barrett’s esophagus and esophageal adenocarcinoma: Experimental and clinical perspectives. Int. J. Mol. Sci. 2018; 19: 2033. doi: 10.3390/ijms19072033. 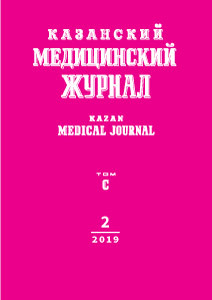 © 2019 Garanin A.A., Osadchuk A.M., Adyshirin-Zade E.E.